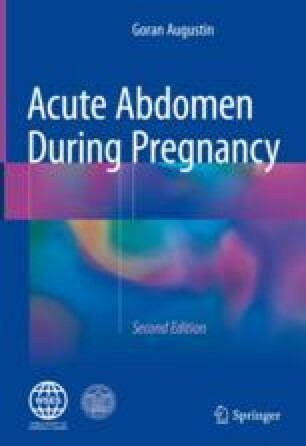 Nontraumatic uterine rupture is a rare but often catastrophic obstetric complication with an overall incidence of approximately 1/1536 pregnancies. In Western countries, it is five times less common. The vast majority of spontaneous uterine ruptures occur in women who have uterine scars, mostly as a consequence of previous Cesarean deliveries. The most consistent early indicator of uterine rupture is the onset of a prolonged, persistent, and profound fetal bradycardia. Other signs and symptoms, such as abdominal pain, abnormal progress in labor, and vaginal bleeding, are less consistent and less valuable in establishing the appropriate diagnosis. Labor-and-delivery suites should be able to start Cesarean delivery within 20–30 min of a diagnosis of fetal distress. In the case of fetal or placental extrusion through the uterine wall, irreversible fetal damage can be expected at that time; therefore, such a recommendation is of limited value in preventing major fetal and neonatal complications. However, action within this time may aid in preventing maternal exsanguination and death, as long as proper supportive and resuscitation methods are available before definitive surgical intervention can be successfully initiated.